Once upon a time, there was a boy named Pete. Pete liked Slim Jims. He liked them very much. But as Pete grew older and became more focused on his health, fitness and nutrition, he came to realize that those snack sticks probably weren’t making him healthier. So, he set out to make his own version of the popular snack with high quality ingredients and a small business approach. 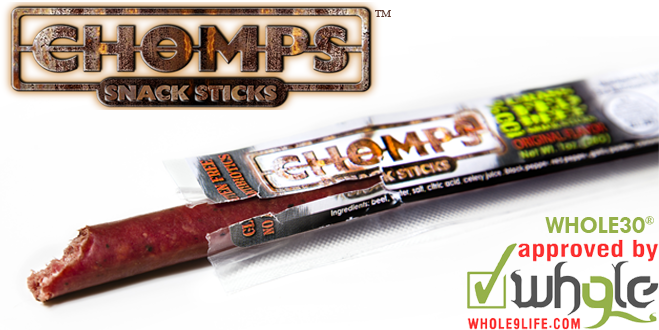 Enter Chomps Snack Sticks, our newest Whole30® Approved partner. We sat down with Pete, founder of Chomps, to find out more about these snack stick we’re sure you’ll want to snap into. W9: We talked about it a little in the intro, but tell us the real story of how Chomps got started, and what the company looks like now. Pete: I’ve always been involved in sports and developed a keen interest in fitness and nutrition at a young age. I have also always had an entrepreneurial mindset and had been involved in a number of start-ups in fitness and real estate since I was in my early twenties. About three years ago, I was introduced to the Paleo diet. I’m not a big guy, but anyone that knows me knows that I eat…a lot. I grew up eating tons of Slim Jims. I don’t know what I was thinking, but I loved those things. I decided I wanted to create a healthy grass-fed version of them, without all of the added garbage, and Chomps was born. Personally experiencing the benefits of replacing all of the gluten and sugars with lean proteins, vegetables, fruit, and healthy fats–I was hooked. I started the company in early 2012 and still run it out of my home office. We have a manufacturing partner with a large facility that actually makes the Chomps. I also took on a partner, Rashid, our COO. He oversees all operations and makes sure everything runs smoothly. It’s just us two, our wives and a small order fulfillment team. It’s a great dynamic and it works well for us. We’ve had a ton of great feedback from all of our customers and now we have celebrity clientele (we can’t mention whom, sorry), which is pretty cool. Demand for Chomps is growing exponentially, as is our customer base. We’re still a small business, but our customers appreciate the fact that we do not cut corners. Our philosophy is to deliver a top quality product and offer attentive, personable customer service. It’s worked for us so far, so we’ll stick with it! W9: So, what does it take to source the “healthy grass-fed” snack stick? Pete: Quality sources are important to us as we strive to offer the best quality product we possibly can. In addition to this, we want to make sure we are supporting local producers. All of our grass-fed beef is sourced from small local ranchers and producers in the Midwest. We ensure that all animals are raised to our standards and are not only grass-fed, but also grass-finished and are never given any antibiotics or hormones. These guys work extremely hard and they can only produce a limited number of animals each year. Last year’s drought was devastating to their businesses, so we want to do everything we can to help them bounce back. 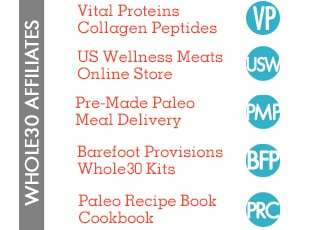 W9: There are so many other jerky products on the market – even a couple in our Whole30 Approved category. What do you believe sets Chomps apart from the other jerkies, conventional and “high quality,” on the market? Pete: Chomps is different from other jerkies or meat snack sticks because of the efforts we put into making sure we continually deliver the best quality product we can. When we were searching for manufacturers we made sure to find one that not only understood the nutritional requirements we were going for (i.e. no synthetic nitrates, nitrites, MSG, additives or preservatives, etc) but also could produce a product that met our flavor profile and texture requirements. We found the perfect match. There are other “high quality” products that I believe are, in fact, high quality. But, competition is healthy, and it forces us to be on the top of our game. We don’t claim to be the only ones in the space, but we definitely like to think that we are the best. If you’re not going to strive to be the best, why bother? W9: Right now folks can buy your products online, are there any physical retail locations that carry Chomps? Pete: Yes, we have over 30 retailers (both chains and “Mom and Pop” stores) carrying Chomps now, and we’ll be slowly adding new retailers over time.  We plan to roll out national distribution later this year, so we’re trying to scale the business one step at a time. It’s a lot of work, but we’re enjoying it. If you’re itching to get your hands on some Chomps of your own, you’ll get 15% off of your order for the entire month of July! Visit http://gochomps.com and use promo code IAMWHOLE30. 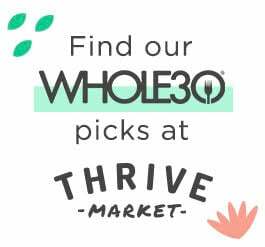 Plus, they’re giving away a 10-pack of snack sticks to three Whole9 readers, as a way to introduce you to our newest Whole30 Approved partner. Just like the Chomps Facebook page and comment here telling us how you’re gonna snack on your Chomps. We’ll choose a winner on Monday July 15th, and announce it here on the blog.